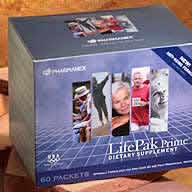 Lifepak Prime contains all the nutrition in Lifepak anti-aging formula and more. Add quality years to your life by providing the vitamins, minerals, and trace elements your body needs to protect and regenerate cells. Lifepak Prime all-natural dietary supplements addresses the specific needs of men over 40 and post-menopausal women with BioGinkgo 27/7 extract (ginkgo biloba), milk thistle, glutathione, alpha-lipoic acid, coenzyme Q10, and grape seed extract. Lifepak Prime provides 150 IU, or 500 % daily value, of vitamin E, increased levels of B6, B12, and zinc for optimal nutrition intake. Lifepak Prime also provides unique dietary components for bone health, as well as those that support memory and circulation. My family uses Lifepak so I'll be happy to answer questions about Lifepak on the Lifepak message board. We'd also love to hear from other people who are using Lifepak. Lifepak Prime is optimized for men over 40 and post-menopausal women. There is also a Lifepak for pregnant and lactating women (Lifepak PreNatal), Lifepak for woomen from 18-menopause (Lifepak Women), and adults from 18 to 40 (Lifepak anti-aging formula).